Yellow-vented Bulbuls with their disappearing act! Now you see, now you don’t! All was progressing well and suddenly without warning, at the eleventh hour, the parents just abandoned their clutch of two eggs that were about to be hatched! What a sad ending… from joyful hope to despair! 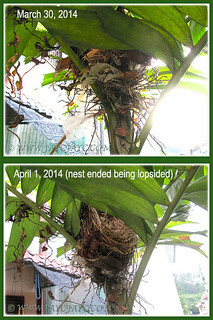 We were so hopeful for the pair of bulbuls that headed straight for the Macarthur Palm trees at our backyard and started building their nest, during the third week of March. Was it the same pair of bulbuls that almost succeeded to fledge a hatchling last January at the very same location, we wondered? Probably not, maybe this current pair were first-timers as the nest-building took less than two days, from March 19-20, a quickie job that resulted in a flimsy and poorly structured nest! 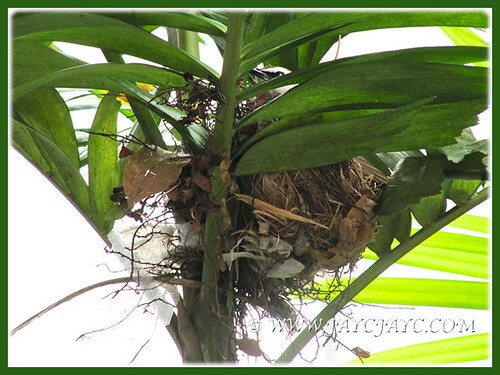 The rather shallow, cup-shaped nest was mainly made of twigs or vine stems, leaves, grass and plastic strips and located atop the Macarthur Palm, about 8 feet off the ground. Totally satisfied with their new home for the breeding season, the bulbuls then disappeared for several days on end. On March 27, about 8-9 days later, they returned with lovely chirping call to announce their arrival, and just in time for the hen to lay its eggs. 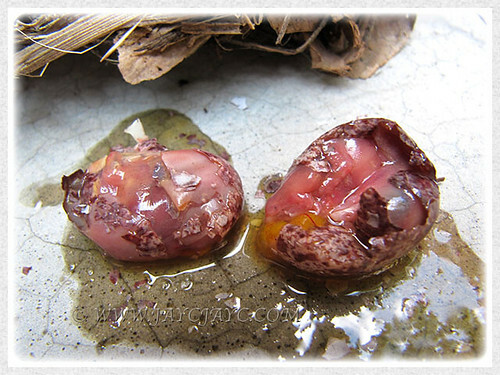 Generally, two eggs are laid but can be up to five, and gorgeously coloured whitish-pink with reddish-brown spots. Somehow you’d be able to guess the eggs were laid when the excited bulbuls make happy warbling sounds to celebrate. 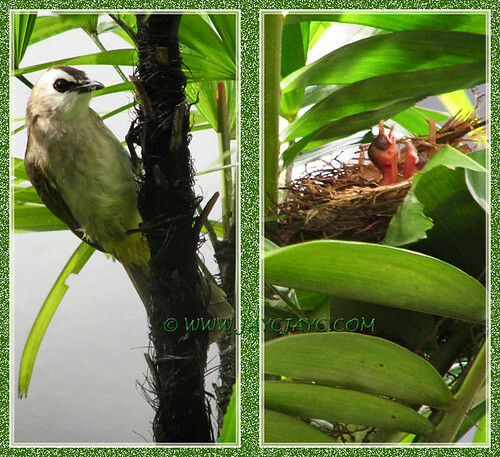 We thoroughly enjoyed (me especially) watching this pair of Yellow-vented Bulbuls trying to start a family. I was absolutely excited that the bulbuls chose our backyard as their ideal spot again as it enabled me to keep a close watch on the activities of the birds every day. 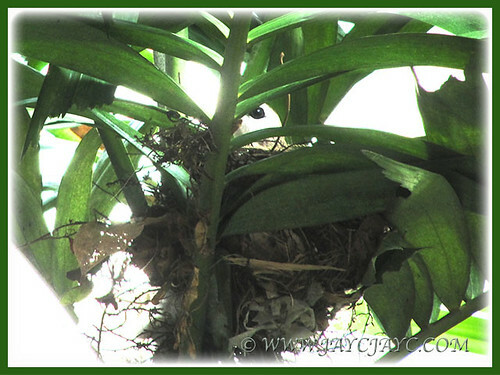 This time though, I wasn’t able to get good shots from the kitchen side as the nest was partially hidden by the palm fronds. Hence, I had to ‘spy’ on the birds’ activities through the window-louvers at the room adjacent to the kitchen. Not a convenient angle to watch and capture shots from as it was much further from the nesting location. Nonetheless, I was well-shaded by the window curtains, preventing the birds from noticing me. 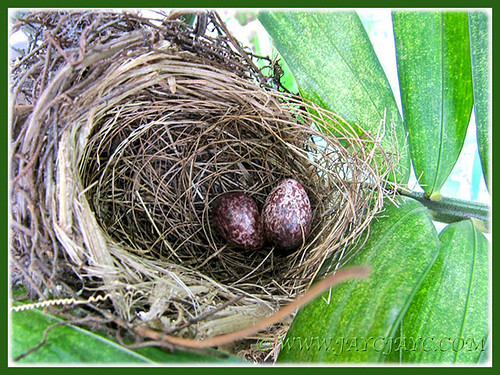 I had many joyful sessions witnessing them incubating the eggs from day one onwards. The parents would visit the nest, off and on throughout the day, taking turns to incubate the eggs between 10 to 15 minutes each time before flying away. Towards dusk though, only one parent (probably the hen) would stay and incubate through the night. These bulbuls are smart, cautious and meticulous. When approaching the nest, the bulbul would first perch from a vantage point overlooking it and check to see if there were any danger before entering the nest quickly. Weather had not been kind to them ever since the eggs were laid. Strong winds with heavy rain and thunderstorms were the order of the day for most evenings. These elements eventually caused the nest to be tilted and unsafe (as illustrated in the images below). 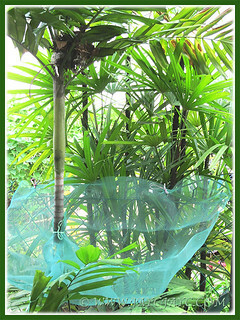 Hence, we had a mosquito netting spread out several feet below the nest as a precautionary measure, just in case. We were cautiously hopeful that all would turn out fine for the bulbuls, but nature dictated otherwise. Incubation usually takes about nine days. This pair of Yellow-vented Bulbuls did their job dutifully for eight days. However, on the ninth morning of April 4 when hatchlings should have emerged, the parents were nowhere to be seen or heard. Just vanished without a trace, so to speak. We feared for the worst when they did their disappearing act for the whole day. It was most crucial as this was to be their day of celebration, to welcome their brood of two chicks as new addition to the family. The next day… and the next… and the next… still no sign at all of the parents! 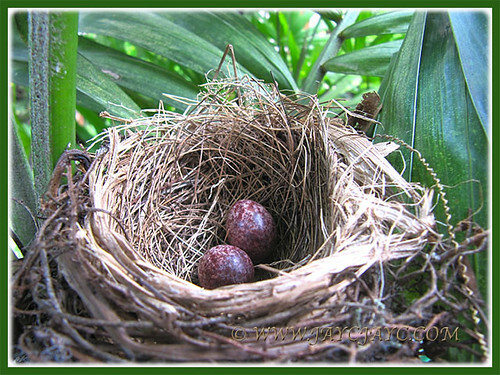 Goodness gracious… the pair of Yellow-vented Bulbuls have abandoned their eggs and disappeared for good! It was too sudden and unexpected. Why oh why? What went wrong… so many questions unanswered? I suppose the parents know best… their instinct must have pre-warned that the tilted nest was definitely unsafe to bring up the hatchlings and decided to leave the scene for good. Or maybe the incubation had failed due to insufficient warmth and fluctuating temperatures caused by the daily heavy downpour, and resulted in premature embryonic death. What a waste… so close to hatching the eggs and having a family! Must have been so very sad, depressing and tragic for the pair of Pycnonotus goiavier. We really felt sorry for them. What a misadventure! What to do next? Googled for answers about abandoned eggs and most people had advised to leave them as-is. 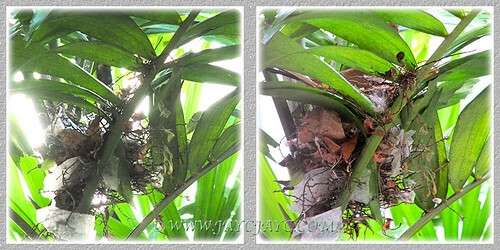 On April 8, after 5 days of abandonment and convinced that the hatchlings wouldn’t ever emerge, I detached the nest with the unhatched eggs from the Macarthur Palm tree. What’s the inside like, I wondered? My curiosity got the better of me and dictated my next course of action. You’ve guessed right… I gently cut open the egg shells with a kitchen scissors and the photo below shows their contents. How distressing… the embryos appeared to be in the process of full development before being abandoned. Still wondering what went wrong! Eggtopsy not done, as not only I dare not touch them but clueless on how to go about it, what to look for and the whys and wherefores of the whole thing. Still feeling confused and sad. Face it… that’s nature! Want to know more? Some interesting reading on observations on the behaviour of the Yellow-vented Bulbuls by the Bird Ecology Study Group, Nature Society (Singapore), here. NOTICE: Finally found out that the bulbuls that visited us or have been breeding in our garden these past years were actually Yellow-vented Bulbul (Pycnonotus goiavier). They had been wrongly identified by me previously as White-browed Bulbuls (Pycnonotus luteolus). Correction of names in all related articles will be edited the soonest possible. Sorry for the misidentification. Thanks for sharing the story and pictures. It’s heartbreaking. I’m not sure if you touched the nest, went too near it or were around it too frequently? 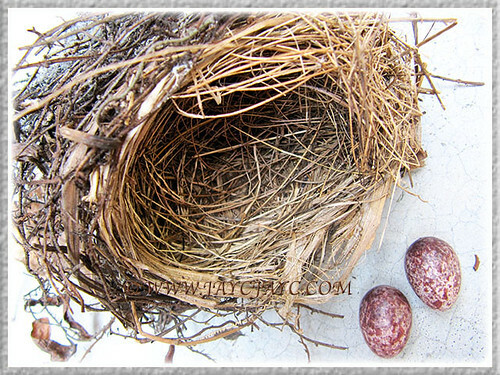 Animals are sensitive and can abandon their nests / young if our scent get on the eggs / nests / young. When was the mosquitoe netting placed? Perhaps they were scared off of felt threatened by the netting? Our pleasure in sharing, Vic. I cannot remember what went wrong. Nonetheless, we’ll try to be more cautious next time. Much thanks for your tips.